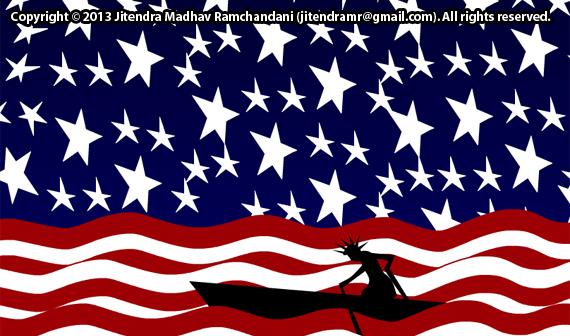 Jitendra's Blog: Is the American dream even possible? Is the American dream even possible? Came across Rafat Ali's blog post on an excerpt from famous book America and Americans written by John Steinbeck. The author has beautifully portrayed the brand 'American' and its juxtapositions. Here is the excerpt from his book. One of the generalities most often noted about Americans is that we are a restless, a dissatisfied, a searching people. We bridle and buck under failure, and we go mad with dissatisfaction in the face of success. We spend our time searching for security, and hate it when we get it. For the most part we are an intemperate people: we eat too much when we can, drink too much, indulge our senses too much. Even in our so-called virtues we are intemperate: a teetotaler is not content not to drink—he must stop all the drinking in the world; a vegetarian among us would outlaw the eating of meat. We work too hard, and many die under the strain; and then to make up for that we play with a violence as suicidal. The result is that we seem to be in a state of turmoil all the time, both physically and mentally. We are able to believe that our government is weak, stupid, overbearing, dishonest, and inefficient, and at the same time we are deeply convinced that it is the best government in the world, and we would like to impose it upon everyone else. We speak of the American Way of Life as though it involved the ground rules for the governance of heaven. A man hungry and unemployed through his own stupidity and that of others, a man beaten by a brutal policeman, a woman forced into prostitution by her own laziness, high prices, availability, and despair—all bow with reverence toward the American Way of Life, although each one would look puzzled and angry if he were asked to define it. We scramble and scrabble up the stony path toward the pot of gold we have taken to mean security. We trample friends, relatives, and strangers who get in the way of our achieving it; and once we get it we shower it on psychoanalysts to try to find out why we are unhappy and finally—if we have enough of the gold—we contribute it back to the nation in the form of foundations and charities. We fight our way in, and try to buy our way out. We are alert, curious, hopeful, and we take more drugs designed to make us unaware than any other people. We are self-reliant and at the same time completely dependent. We are aggressive, and defenseless. Americans overindulge their children and do not like them; the children in turn are overly dependent and full of hate for their parents. We are complacent in our possessions, in our houses, in our education; but it is hard to find a man or woman who does not want something better for the next generation. Americans are remarkably kind and hospitable and open with both guests and strangers; and yet they will make a wide circle around the man dying on the pavement. Fortunes are spent getting cats out of trees and dogs out of sewer pipes, but a girl screaming for help in the street draws only slammed doors, closed windows, and silence. Now there is a set of generalities for you, each one of them canceled out by another generality. Americans seem to live and breathe and function by paradox; but in nothing are we so paradoxical as in our passionate belief in our own myths. We truly believe ourselves to be natural-born mechanics and do-it-yourselfers. We spend our lives in motor cars, yet most of us—a great many of us at least—do not know enough about a car to look in the gas tank when the motor fails. Our lives as we live them would not function without electricity, but it is a rare man or woman who, when the power goes off, knows how to look for a burned-out fuse and replace it. We believe implicitly that we are the heirs of the pioneers; that we have inherited self-sufficiency and the ability to take care of ourselves, particularly in relation to nature. There isn’t a man among us in ten thousand who knows how to butcher a cow or a pig and cut it up for eating, let alone a wild animal. By natural endowment, we are great rifle shots and great hunters—but when hunting season opens there is a slaughter of farm animals and humans by men and women who couldn’t hit a real target if they could see it. Americans treasure the knowledge that they live close to nature, but fewer and fewer farmers feed more and more people; and as soon as we can afford to eat we eat out of cans, buy frozen TV dinners, and haunt the delicatessens. Affluence means moving to the suburbs, but the American suburbanite sees, if anything, less of the country than the city apartment dweller with his window boxes and his African violets carefully tended under lights. In no country are more seeds and plants and equipment purchased, and less vegetables and flowers raised. The paradoxes are everywhere. We shout that we are a nation of laws, not men—and then proceed to break every law we can if we can get away with it. We proudly insist that we base our political positions on the issues—and we will vote against a man because of his religion, his name, or the shape of his nose. We fancy ourselves as hard-headed realists, but we will buy anything we see advertised, particularly on television, and we buy it not with reference to the quality or the value of the product, but directly as a result of the number of times we have heard it mentioned. The most arrant nonsense about a product is never questioned. We are afraid to be awake, afraid to be alone, afraid to be a moment without the noise and confusion we call entertainment. We boast of our dislike of highbrow art and music, and we have more and better-attended symphonies, art galleries, and theaters than any country in the world. We detest abstract art and produce more of it than all the rest of the world put together. One of the characteristics most puzzling to a foreign observer is the strong and imperishable dream the American carries. On inspection, it is found that the dream has little to do with reality in American life. Consider the dream of and the hunger for home. The very word can reduce nearly all of my companions to tears. Builders and developers never build houses—they build homes. The dream home is either in a small town or in a suburban area where grass and trees simulate the country. This dream home is a permanent seat, not rented but owned. It is a center where a man and his wife grow graciously old, warmed by the radiance of well-washed children and grandchildren. Many thousands of these homes are built every year; built, planted, advertised, and sold—and yet, the American family rarely stays in one place for than five years. The home and its equipment are purchased on time and are heavily mortgaged. The earning power of the father is almost always overextended, so that after a few years he is not able to keep up the payments on his loans. That is on the losing side. But supposed the earner is successful and his incomes increases. Right away the house is not big enough, or in the proper neighborhood. Or perhaps suburban life palls, and the family moves to the city, where excitement and convenience beckon. For Americans the wide and general dream has a name. It is called “the American Way of Life.” No one can define it or point to any one person who lives it, but it is very real nevertheless, perhaps more real than that equally remote dream the Russians call Communism. These dreams describe our vague yearnings toward what we wish we were and hope we may be: wise, just, compassionate, and noble. The fact that we have this dream at all is perhaps an indication of its possibility. Here is the scan of the original column from Saturday Evening Post published in 1976.